Click Here to see our handpan selection. 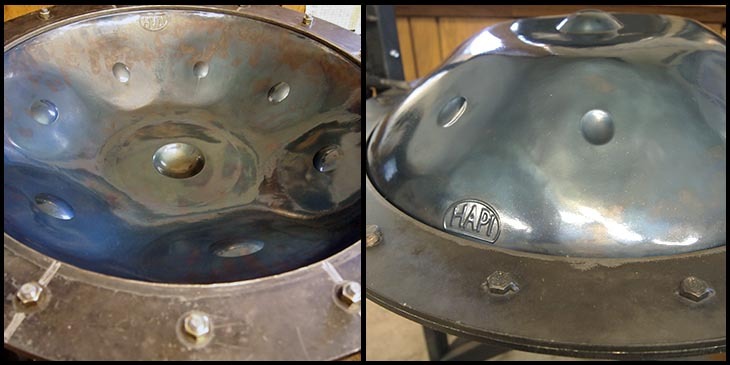 The HAPI Handpans are made by me, Grahm Doe in Oakhurst, California. I got my first handpan a (PANArt Hang) as a gift from my wife, Trish in 2002. At the time we organized a Didgeridoo Festival in Joshua Tree, CA. There were didgeridoos and all sorts of unique instruments represented there. A friend was helping find homes for a few of the amazing Hang from PANArt. He was working with a U.S. distributor for PANArt (the creators of Hang in Switzerland). Secretly Trish conspired with him to acquire a Hang for me. I was blown away to be gifted with such a beautiful handpan and it changed my life. It’s amazing that new musical instruments, like the handpan, are being created from steel, an evolution of sound for the 21st century. I have been working with steel as a creative medium since high school and furthered my studies with metallurgy in college. I am always fascinated by how steel can be bent, cut, drilled, welded, heat treated, to change its composition and formed into all sorts of useful things. I began experimenting with different steels, dies and molds for my handpan instruments. I found tuning to be near impossible in the beginning. Creating three different simultaneous tones in one note on a handpan was a hard concept to grasp. I went to Texas and studied with a pan maker which helped. During this time, I also began experimenting with steel tongue drums when Trish showed me a tongue drum by Dennis Havlena and his a technique for making one. This turned out to be a great jumping off point for experimenting and coming up with our own versions for steel tongue drums. I really enjoy prototyping and trying different things. Learning how to get the most out of the sound of steel takes a lot of practice. Trial and error helps a lot when learning to make a handpan as there are many variables to experiment with. As I continued working towards a handpan I acquired some more tools to help with the process. Together with Dave Beery we collaborated on many different things and experiments. 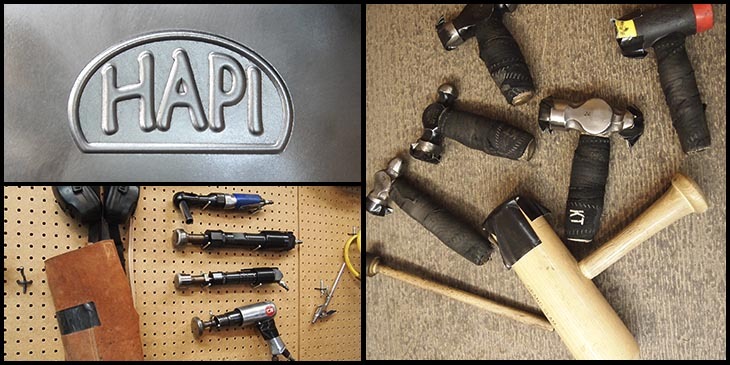 I built my own shop with custom made tools and tuning rings. With helpful guidance from Dave and a huge pile of rejects, I started making good progress in the summer of 2014. We began offering handpans for sale in 2016. Each handpan takes thousands upon thousands of hammer blows to shape and tune. Heat treatment is used to adjust the steel. Our steel produces a wonderful warm tone. Once a proper note shape has been set on the handpan, it holds its tuning very well. It takes me about 1 week to make a handpan. I also do several rounds of tuning until the handpan has settled into proper stable tuning. It takes more blood, sweat and tears to make a handpan than I ever imagined. It’s certainly one of the hardest things in my life I have learned to do. One of the most wonderful things about creating a handpan is towards the end of the process. After days of working on an instrument there is a point where the tones and vibrations form together. The handpan truly becomes alive and sounds incredible. Each handpan is slightly unique and has its own voice and that is part of the beauty. I want to give much hearfelt thanks to PANArt for creating the first instrument, also thanks to all who have helped me along the way and the amazing community of handpan lovers worldwide! Our handpan instruments have a beautiful bloom, the top note excites the side notes into ringing. Each handpan note is tuned with a fundamental, octave, fifth for a rich sound. This increases the harmonic tones. There are many overlapping harmonics in the handpan throughout the scale which help produce an amazing robust sound. Made from heat treated steel. Each handpan is hand worked, and carefully tuned with a strobe tuner. 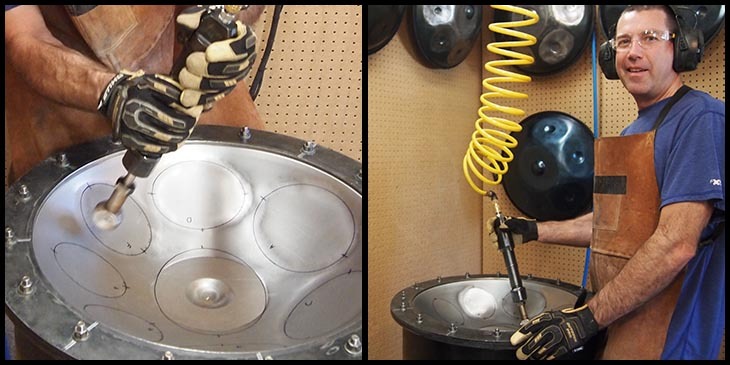 Our handpan instruments are made with thousands upon thousands of precision hammer blows. There is a custom made rubber ring around the side of the handpan to help protect the instrument. Each handpan purchase includes: handpan, free handpan hard case, free shipping (within cont. US), handpan instruction booklet. Oh MY!!! I was literally on the edge of my seat all day and now the handpan is finally here! My new instrument! Grahm, THANK YOU so much for all of your hard work on this amazing handpan. I cannot wait to learn how to play. It's absolutely gorgeous, it sounds beautiful and has an amazing bloom, WAY better than I could have ever hoped for. Thank you thank you thank you!!! I have never been happier with any instrument before. It seems to have the ability to sync with the primitive mind, allowing for an almost immediate ability to play, regardless of musical background or experience level. It is not just the mesmerizing sounds you hear that make it so joyful. There is a component to it that you physically feel; reverberations of a therapeutic and soothing quality. It is a true work of art in all ways; a beautiful handpan masterpiece. I am extremely pleased with the Hapi Handpan. This is a great pan, and the sound and resonance is absolutely great. I am still learning its particular playing techniques due to the individual work of sound art that it is. I own and have played many others, and your handpan is the one that I will use for creative meditation. The sound is open, and all notes are evenly matched, and well in tune. The entire Handpan is very pleasing visually, and the craftsmanship is very high. I will purchase again. I am delighted to tell you my Hapi Handpan arrived this morning. Thanks for the great service. It came so fast from when I placed the order to when it was in my hands. You packaged it so well, too, and it arrived in perfect condition. It looks and sounds beautiful. I am so pleased and look forward to playing it often for my own contemplative enjoyment and for the deep relaxation of students at the end of my yoga classes. Thanks so much for all your dedicated, hands-on learning and labor of love that have gone into making this instrument. I have already been playing and loving three HAPI steel tongue drums, and this handpan brings my appreciation and potential for meditative musical expression into another wondrous dimension. The HAPI Handpan arrived safe and sound! Sounds amazing, just as good as any handpan I have heard on the internet! Thank you very much. Your creation will be heard by many people and I will be sure to tell them where it is from...thank you again.